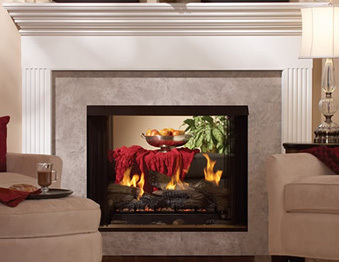 A see through fireplace is a unique feature for any home, but Empire's 36 inch flush see through firebox is one of the best. It has two open sides to provide an exceptional view of your fire and is light and easy to install in any home. The seams are hem bent to eliminate insecure screws or fasteners. Included is a matte black hood and a banded brick ceramic fiber liner. Another great feature of this firebox is that it requires no venting and includes a 5 year limited warranty. Can this be placed on an outside wall? Unfortunately, not. There are no provisions or accessories available that would allow for an indoor/outdoor installation of this or any other vent free unit. Can the Empire Breckenridge Premium be wall mounted and is it natural gas? First, please allow me to clarify that all Empire Breckenridge models such as this unit are the firebox only; no burner or log set is included. Next, none of them can be wall-mounted; the boxes are suitable for recessed, built-in/framed installation inside a full enclosure (such as a wall or mantel cabinet) only. I was wondering, if I don't use the wood logs, can I replace them with glass pebbles? Also, in order to give it a more modern look, can I cover the metal edges with my wall veneer/marble slab? Lastly, if this is vent-less, doesn't it still need a flue duct to outside? Thank you. The ventless unit must use the media it is rated for, so that would depend on the burner you have chosen. The trays that are for the logs are different from those that use glass. Ventless units do not need any venting and there is no knockout for an air intake kit on this model. You may cover the face of that firebox with any non combustible, pretty much right up to the opening. Can you use a blower with this model? The flush version of this firebox cannot utilize a blower as there are no channels allowing air flow around the firebox back into the room. Is this just the fire box? Does it have the brick panels on the ends? Can the box be different finishes such as brass, stainless? This is indeed just a vent-free see thru firebox. The unit will come complete with a pair of ceramic banded brick liners on either of it's closed ends. At this time, there are not any different finishes available for the box itself, however there are numerous decorative door overlays and trim kits that can be used on the unit. These are located in the accessory tab on the item page. What are the dimensions of a wall this would fit in? How deep does the wall need to be? This unit only requires a framing depth of 21". This dimension assumes the use of 1/2" wall board as finishing material.